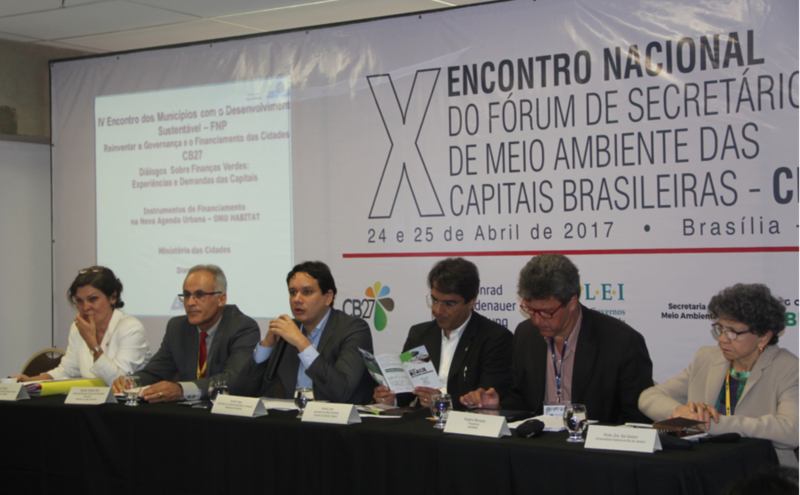 On April 23-25, the X National Conference of the Forum of Secretaries of the Environment of the Brazilian Capital Cities - CB27, was held in Brasilia. 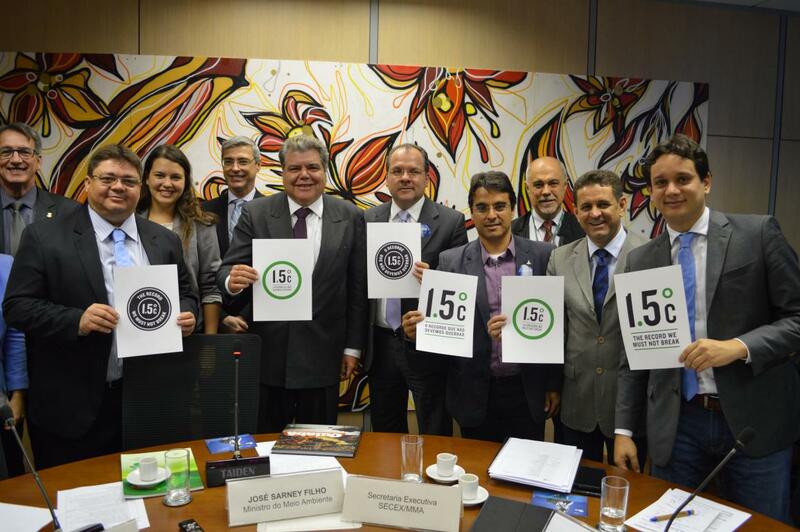 The meeting took place within the framework of the Fourth Meeting of Cities with Sustainable Development ( Encontro dos Municípios com o Desenvolvimento Sustentável, EMDS), organized by the National Front of Mayors (Frente Nacional de Prefeitos, FNP). The topic of the 2017 EMDS was Funding and Governance and, within the current context then, the subject of Funding for the Brazilian Capital Cities was chosen to guide the agenda of the meeting. 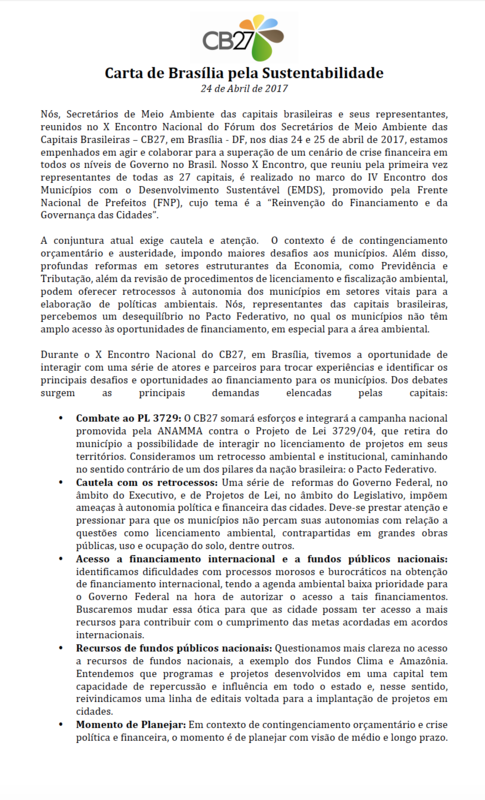 The goals of the meeting were to map and present sources of green funding for the capital cities; identify and discuss the cities’ demands regarding funding; present potential partners for this agenda to capital cities and facilitate dialogues; promote the dialogue with mayors of capital cities and the commitments of the Global Covenant of Mayors for Climate & Energy; select venues for upcoming CB27 conferences; and follow up on the CB27 strategic guidelines and activities for 2017. 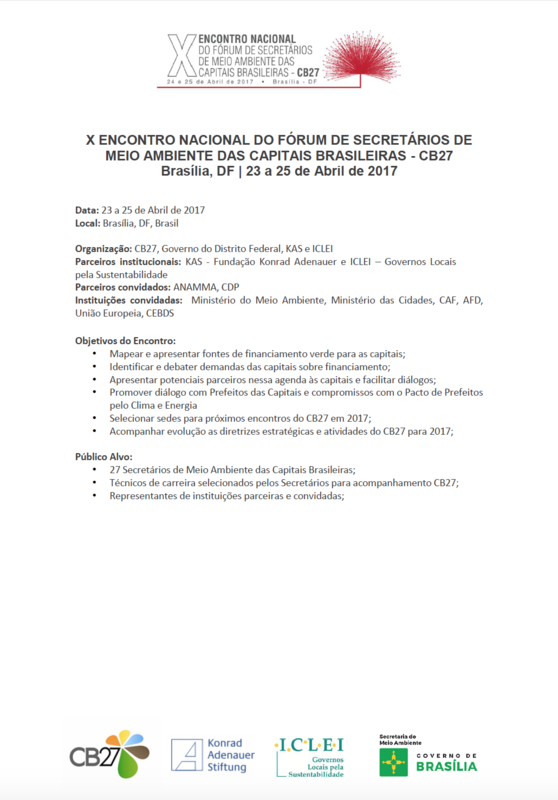 The Forum of Secretaries of Environment of the Brazilian Capital Cities, CB27, was created during the process of preparing Brazilian cities for the United Nations Conference on Sustainable Development (Rio+20), held in May 2012, with the goal of promoting the political coordination and cooperation among capital cities and seeking solutions to the common environmental problems of Brazilian cities, focusing on tackling climate change. Forum CB27 relies on financial and institutional support from the Konrad Adenauer Foundation and institutional support from ICLEI - Local Governments for Sustainability to promote its activities.